A healthy human being is an asset to the society, and hence we all must aim to remain fit and healthy forever. To be more specific, a fit body and a glowing skin are the basics of healthy living and having good nutritious diet is the simple secret to get it right. If we learn about ancient times, you will find that our ancestors were much fitter and healthier in comparison to us. The simple reason behind it is that most of them led a very disciplined lifestyle and ate healthy unlike most of us. We all desire to have a fit body and glowing skin but when it comes to execution, we feel lazy and often ignore it, which in turn does not let us achieve our fitness and beauty goal. But, if you are determined to get the natural charm of your ancestors and keep yourself strong forever, you have to start eating healthy foods from today and I am here to help you figure out what is right. In today’s post, I will be sharing with you the list of 10 best diet rules to maintain a fit body and glowing skin forever. You may follow these simple steps to get yourself in shape and maintain flawless skin quality. Today’s world is very competitive where everyone follows the survival of the fittest policy. So, in order to keep pace with this advanced lifestyle, you have to buck up. 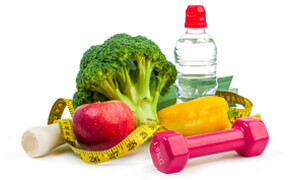 Fitness and good looks are equally important and in order to maintain both, you need to eat healthy. Good facial features are God-gifted but you can easily make yourself attractive and presentable with a glowing skin and a good physique. It will make you feel good from within and boost up your confidence as the fitter you get, the more confident you become. With proper diet, you will also be able to make your immune system stronger. And with stronger immune system, you will rarely fall ill and even when you fall ill, your body will be able to fight it out effectively. My recommended list of 10 best diet rules to maintain a fit body and glowing skin will definitely help you in the course of your life. Proper eating does not only include having good healthy foods. It also means that you have to get rid of your unhealthy habits as well as maintain a proper time to eat your meals and snacks. In short, there are some rules of maintaining a good diet. I will be talking about all of this in my post today. Therefore, keep reading to know more. I personally believe that the physiology of every individual is different so there cannot be any accurate list of foods that can be good for all. In other words, one may benefit a lot from milk but another individual might be allergenic to it. So, what I myself maintain is a good routine diet where I try including most of the healthy ingredients which helps to fulfil the nutritional requirements of my body. It is ok to eat every ingredient but in moderate amounts (except the ones that you are allergenic to or which is harmful for you). However, there are certain basic common diet rules that are useful for everyone. I will share all of them in my following paragraphs. I hope you will benefit from them. Excited to know more? I hear you saying yes. 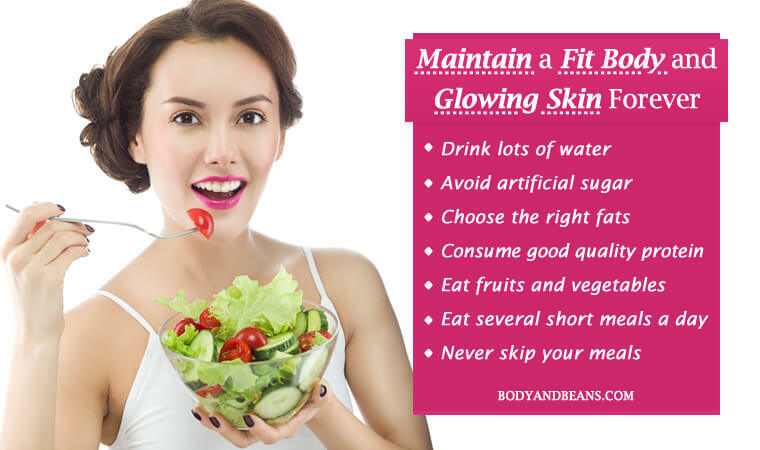 So, without wasting much time, let us begin our discussion on the best diet rules to maintain a fit body and glowing skin forever. Every day your body is exposed to several toxins, which can harm your system a lot. The accumulation of these harmful toxins can be the cause behind several diseases and so they need to be thrown out of your body. This is the main reason you must drink good amount of water and help your body flush out the toxins. Human body contains around 70 % water and it is very important for your body. Drinking less water will make your system dehydrated that will give you the feeling of fatigue and may also lead to indigestion, constipation and acidity. Besides that, it can lead to wrinkles on your skin and make your skin excessively dry, dull and lifeless. So, water intake definitely is an important point in the list of the best diet rules to maintain a fit body and glowing skin. There can be no alternative to drinking water in order to keep your system strong. But if you fall in the list of those who steer clear from water due to its plain blunt taste, you may do a bit of customization with it then. There are several detox water recipes that you may try out. These are nothing but recipes where other healthy ingredients are mixed with water in order to make it taste good and healthier. Detox water recipes are the new craze among today’s generation where most of the youngsters prefer this over plain water. These recipes are good for your skin and can definitely help you get a flawless one easily. Here is a detailed post on detox water to get gorgeous and glowing skin easily. This improvisation with water is also found to help you get a fit body. Drinking these frequently will help you shed extra pounds especially the stubborn belly fat and help you get a dream body. I also have a separate post about detox water recipes to lose weight. The basic detox water can be prepared by adding a few slices of lime and lemon, cucumber, orange etc in a glass container filled with water. Cover the container and refrigerate it for 12 to 24 hrs and it ready to drink. Now that you know the method of preparing detox water for various purposes, do not forget to have detox water frequently as it definitely forms a part of the diet rules to maintain a fit body and glowing skin forever. I know that most of you love the sugary foods and find it hard to avoid them, but if you are determined to follow the diet rules to maintain a fit body and glowing skin forever, then you have to make the sacrifice. According to recent studies as one published in “JAMA”, too much of sugar intake is the main cause of poor cardiovascular health. In fact, it not just weakens your heart, sugar consumption in excess leads to obesity, Type II Diabetes, dementia, liver problems, cancer etc. So, why risk your life eating so much of sugar. There are various names of sugar like raw sugar, brown, starch, corn starch, etc and all of these intakes must be controlled. You must also restrict your consumption of white bread and instead concentrate more on the whole wheat bread. This is because in white bread, the nutrients are removed leaving only gluten and starch behind, which is harmful. Most individuals have this misconception that fats are the main reason behind all sorts of health benefits but in reality, your body needs many of the healthy fats to remain strong. Surprised? Well, yes, there are healthy fats like the saturated fats that we get from the grass-fed animals are good for your health. They keep the immune system, nervous system strong as well balance the hormone levels in body. They are tasty and are instrumental in lifting up your mood. However, if you are eating fat of the animals that are raised on processed foods or grains, then that can harm you. So, basically what I mean to say is that you have to pick the right healthy fats and avoid the unhealthy ones. Also, use organic coconut oil to cook at high temperatures and avoid the organic virgin plant oils like flaxseed oil, olive oil etc. This is because they have low smoke point. If you are physically weak and get tired easily, then your body must be running out of proteins. Physical strength and high energy is the key to a fit body and healthy mind. Proper intake of proteins will help you remain active and energetic throughout the day. Your body requires good amounts of amino acids and so you must consume high quality organic eggs, grass-fed animal protein, wild fish etc. Many individuals find it challenging to meet the protein requirements of their body by eating only plant-based foods. So you must also consume nuts, legumes, organic tofu, wild rice, lentils etc. to meet the protein requirements of the body. One of the most important diet rules to maintain a fit body and glowing skin forever is to eat lots of fruits and vegetables frequently. As per as modern research is concerned, none can beat the importance and nutritional value of fruits and vegetables. The green vegetables like spinach, bitter gourd, cabbage, broccoli etc. are great for your system. They keep all your organs strong and increase your immunity to fight various common diseases. The fresh and juicy fruits are equally tasty and healthy. They help you maintain your body weight as well as impart a healthy glow to your skin. You must try to eat all kinds of fruits and vegetables and of all colours. The phytonutrients in the fruits and vegetables will turn on the health-promoting genes and keep your system active. In one of my posts on the benefits of fruits and vegetables, I had listed 40 fruits and vegetables that are a must for your body, that you may like to check. One of the my most preferred diet rules to maintain a fit body and glowing skin forever is to eat several small meals a day. This is because eating more frequently but in small amounts is found to be better than having less but larger meals. Research has found out that it is good for your body and help in healthy weight loss (although further studies are required to fully confirm it).I personally think, this is a much smarter way of eating than having food at larger amount all at a time. Frequent short meals improve digestion and keep you full for a longer period of time. Ideally, your diet must include around 40 % of plant-based foods, 30% of the healthy fats and the rest 30% of the good proteins. Now, you can prioritize your meals depending on your body requirements. You may also make a good diet chart after consulting a doctor. But, whatever be it, try to eat food at short intervals and in small amounts. In this hectic busy lifestyle, many people have this habit of skipping their meals mostly their breakfast. But let me tell you that it is really dangerous and can cause severe health problems in future. In one of my recent posts, I have in details mentioned how skipping meals especially breakfast can be harmful. Skipping meals make you feel tired and confused. It can even negatively affect your mood and make you irritated easily. For those who do this to save time, let me tell you that nothing is precious than your health and your beauty, so why not take out little time and make the easiest recipes that will save your time as well keep you full. There is also a section of society who skips meals deliberately in the hope to lose weight but my dear friend; this is a completely stupid and inappropriate way to shed kilos. Instead crash diet can make you terribly weak and increase the risk of diseases like gallbladder stone, cardiovascular damage, Diabetes etc. Therefore, never skip your meals and instead include variety of healthy foods that will help you get gorgeous glowing skin and a fit body. In this fast-paced lifestyle, our body is exposed to several harmful factors like pollution, and several others that harms our body and skin to a great extent. Previously simply eating healthy nutritious foods was enough to keep us healthy and strong but now after the massive pasteurized cultivation, the food that we grow in this soil does not contain the same nutritional value as before. Also, many minerals like magnesium, zinc, iron etc. are depleted from many parts of the world. So, naturally we need extra to fulfil our dietary requirements and the best way to do it is to take supplements. You can consult with a good health care professional regarding the supplements that you can take to maintain a fit body and glowing skin and accordingly work on it. However, this is just an optional rule. You may or may not follow it as per wish but if you want my advice, it is better to opt for it. In order to have a fit body and a glowing skin, you need to lead a disciplined and balanced lifestyle. The more organized you are in life, the fitter and more attractive you will get. And, as far as diet is concerned, you need to be disciplined. You may eat all kinds of foods but in lesser quantity. Nothing in excess is good. Even the ingredients that are considered to be healthy if eaten in large amounts may actually show reverse effects. Also, discipline in life overall is important. It is not the food, but also your way of living matters. You need to get rid of smoking if you want your body to be fit and your skin to glow. Smoking damages health a lot and the faster you quit it, the better. Another important diet rule to maintain a fit body and glowing skin is to reduce your alcohol consumption. Alcohol if taken in less amounts may be good mainly for people living in cold countries but when the discipline is broken and you drink it too much, the problem starts to occur. Too much alcohol consumption will increase your body weight and also hamper your skin. So, you have to be careful. Everyone has the right to look good with a fit body and a glowing skin, which are the two main characteristics of being attractive. While some are God-gifted, others have to strive hard to achieve it. However, even though you are naturally gifted, you have to work on it to maintain it, else you may lose it. And, to maintain the fit body and glowing skin forever, proper food intake is important. In my today’s article, I have mentioned some of the diet rules to maintain fit body and glowing skin. Most of the rules are very simple. You will have to get rid of the oily, unhealthy junk stuffs and concentrate on the healthy ingredients. I personally believe that since each one of us has a different body and skin type, so there cannot be any single set of food items that is good for all. In other words, it is not necessary that the food item that is good for me will be good for you as well. So, one must eat depending on one’s body and skin type. However, despite that, there are certain common things that is good for all. From here comes the different diet rules to maintain fit body and glowing skin. If you follow these, then majority of you will be benefited. You will have to maintain a proper routine and diet schedule that is when to eat and in what amounts to eat. Try to eat in less amounts but frequently. Never ever think of skipping your meals and if you do, be ready to face the consequences. Water is important and you need to drink at least 4-5 litres daily. Detox water recipes are also a good option for you to try. Proper balanced diet means eating every ingredient and in balanced amounts. Avoid too much of sugar, eat the good healthy fats and include good quality protein in your diet. Fruits and vegetables of all shapes, sizes and colour are good and you must eat them frequently. Besides, all the above, you have to be a disciplined person. You have to eat healthy as well as get rid of unhealthy practices like excessive smoking and drinking. Apart from eating healthy, disciplined life also includes proper workout and sleep. There must be a balance between them. You have to exercise every day to keep your body fit and strong as well as you need to take rest to look fresh and glowing. Here, also if you can maintain a proper schedule, it will help you. Like a fixed exercise time and a proper sleep pattern. This actually works for me and I am sure it will help you immensely. And, for those of you who feel stressed all the time, meditation is a good thing to do. You may try it out to keep away from the tension and worries. This will help you feel good from within and automatically if you are happy, it will reflect on your face. Do you have a fit body and glowing skin or want to have it?In case you already have, are you wondering how to maintain it? Well, proper disciplined and balanced diet can help you in it. Have you checked out my recommended list of diet rules to maintain a fit body and glowing skin forever? Do try these out and share me the feedback in the comment section. You can suggest some other diet rules to maintain fit body and glowing skin as well. Until then, stay healthy, stay glowing and do not forget to like and share the post with others.